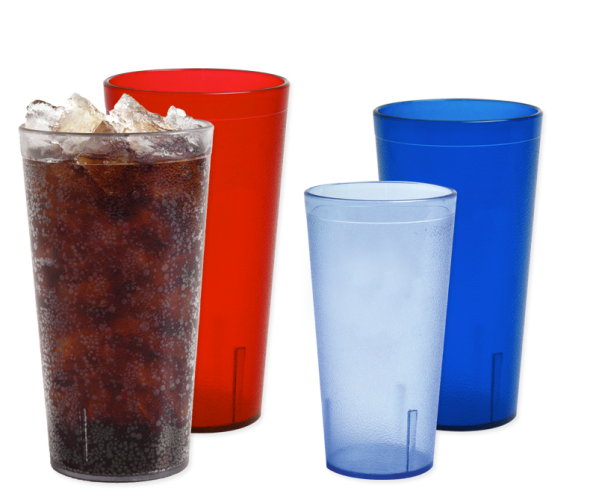 Impact’s colorful, plastic tumblers are a great way to serve your customers ice-cold, refreshing beverages. Whether you’re running an eatery, diner, cafe, buffet, bar or cafeteria, Impact has just the product to get the job done. Standard tumblers are available in four different sizes and colors. They’re stackable and dishwasher-safe, and most importantly: they’re affordable. Impact is dedicated to producing the highest quality injection-molded tumblers. If you’re looking for casual drinkware proudly made in America, look no further. With multiple color and size choices, it’s easy to have two options for serving customers water and soda. This can help your waiters and servers easily see which pitcher to bring to a table. For example, red tumblers can be used for soda or iced tea, and ice blue tumblers can be assigned for water only. Ordering different size options can also be useful. Smaller tumblers like the 12 ounce and 16 ounce are great options for small children. All standard tumblers have a pebbled texture that makes them easy to hold, even when moist with condensation. Don’t want to worry about dropping and breaking glass in your home? Sturdy, plastic tumblers are a smart choice for the dining room. Go ahead and fill up your kitchen cabinets with restaurant-grade drinkware from Impact. You can enjoy a real variety of delicious soft drinks in restaurant tumblers: iced tea, cola, horchata, fruit juice (the options are endless). All of our tumblers are made of Styrene Acrylonitrile (SAN 335T) and are BPA Free. SQF Level 2 is recognized as a Global Food Safety Initiative (GFSI) benchmark, meeting international safety requirements, and is considered “an international mark of excellence for the certificate holder.” Impact International, Inc. is the first company in the State of Nevada to achieve the SQF Ed. 7.2, Level 2 certification for Manufacturer of Food Contact Packaging.